Dorothy Thompson (July 9, 1893 - January 30, 1961) was an American journalist who gained international celebrity when she became the first journalist to be expelled from Nazi Germany in 1934. In 1939, Time magazine called her one of the two most influential women in America, second only to First Lady Eleanor Roosevelt. Nicknamed "the blue-eyed tornado," her ability to "get the scoop" when it came to interviewing Hitler, her candid talk in her columns and radio addresses, and her tireless efforts for war refugees all earned her enormous popularity with Americans seeking to understand their role in the world before and after World War II. Her biographer said of her, "she was the voice of courage and exceptional fluency." For her dedication to reporting the truth and awakening Americans to the realities of Nazism, she earned the title, in the 1930s, of "First Lady of Journalism." At the height of her fame, her column was carried by 170 papers, and was read by eight to ten million people a day. Dorothy Thompson was born in Lancaster, New York, the daughter of British born Methodist minister Peter Thompson and Margaret Grierson, who died in 1901, when Dorothy was only eight years old. She enjoyed a close relationship with her father and throughout her life the influences of Christian conservatism can be seen in her worldview and her reporting style. When her father remarried, Dorothy, who did not get along with her new stepmother, moved to Chicago to live with an aunt. After high school, she attended Syracuse University and upon graduation began work as a suffragette activist in Buffalo, New York. In 1917, she campaigned successfully for the passage of a state constitutional suffrage amendment in New York. This step furthered the suffragette cause on the national level, which ultimately awarded women the right to vote. Thompson's sense of adventure led her to Europe, where she endeavored to become a foreign correspondent. Freelancing and selling her articles to the American Red Cross, among others, she secured an interview with Terence MacSwiney, then mayor of Cork, Ireland, who was in the midst of his fatal hunger strike against British rule. Soon, the Philadelphia Public Ledger hired her as their Berlin bureau chief. She was noted for being the first woman journalist to hold a high level position overseas, which she remarked on as being, "nothing extraordinary." It was on an assignment from Cosmopolitan Magazine in 1931, that Thompson snared an interview with Adolf Hitler responsible for created the stir that caused her expulsion from Germany. In a remark that turned out to be a gross understatement—but one that still infuriated the Fuhrer—she stated that she was totally unimpressed with his “utter insignificance” and, that she “considered taking smelling salts” to keep from fainting. She also called Nazism, "an enormous mass flight from reality." Later, Thompson would regret the fact that she dismissed Hitler as "insignificant" and she would work especially hard to make sure Americans understood the danger he represented to world stability. 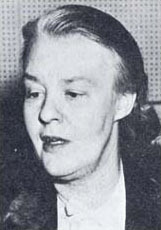 Her expulsion only served to enhance her celebrity and once back in the United States, Thompson began to write her popular thrice weekly column "On the Record" for the New York Herald Tribune. The column, popular for its strident and straight forward rhetoric, was syndicated to nearly 200 hundred newspapers. She also began writing a monthly column for the Ladies Home Journal magazine and in 1937, she began giving weekly radio commentary on world events. She claimed that her best writing occurred during this period when she interpreted world events in terms of the threat of fascism. She attacked the pro-isolationist views of pilot Charles Lindbergh and the America First Movement prior to World War II. Additionally, her radio addresses brought attention to the plight of refugees and her article, "Refugees, A World Program," helped to initiate an international conference in France on behalf of those suffering in Europe after the war. Thompson encouraged the United States to establish a global refugee aid program. Dorothy Thompson's political views sometimes seemed contradictory. While, her popular column "On the Record" was described as being "crisp, outspoken…but always in the political center," she was also a notably strong conservative influenced by her Methodist upbringing. She usually voted as a Republican and supported Wendell Wilkie in his presidential bid against Franklin D.Roosevelt in 1940, but switched mid-campaign because as she said, "the Axis Powers wanted Roosevelt's defeat." She had been heretofore uncomfortable with FDR's popularity because it was reminiscent—to her way of thinking—of the blind following inherent in Fascism. This switch caused her column to be dropped from the Republican newspaper, The Herald Tribune. Another political reversal after World War II jeopardized her popularity. Initially in favor of the creation of the Israeli nation, she changed positions and became increasingly pro-Arab. As a result, the New York Post dropped her column in March of 1947. In 1922, while working as a correspondent in Europe, Thompson married Hungarian Jewish intellectual Josef Bard, whom she met in Budapest. She was in Hungary working on an exclusive interview with the deposed King. She reportedly achieved this early career coup by "disguising" herself as a Red Cross worker. However, the marriage did not survive her move and subsequent promotion to Chief of Bureau Staff for the Philadelphia Public Ledger and the New York Evening Post in Berlin. In 1928, she married Sinclair Lewis, who purportedly followed her around Europe asking for her hand in marriage. Lewis's biographer (Lingeman, p. 323) stated that Thompson "married a creative genius who also happened to be an alcoholic." Their son, actor Michael Lewis, was born in 1930. The couple divorced in 1942. Her highly publicized relationship with Lewis was said to have provided the inspiration for Katharine Hepburn's and Spencer Tracy's iconic performances in the film Woman of the Year (1942). Once commenting on how her career eclipsed both of her prior marriages, Thompson said, "…The world was my first love and I have a faithful heart." Thompson remained married to third husband, Maxim Kopf, the Austrian artist, from 1943 until her death. Dorothy Thompson died in Lisbon, Portugal, in 1960, of a heart attack while visiting her daughter-in-law. She was buried in a cemetery near Twin Farms, the rural Vermont home she shared with Sinclair Lewis and son, Michael. One of her last published articles, written for Atlantic Monthly, the year that she died, was a tribute to Sinclair Lewis. In 1938, Thompson championed the cause of a 17 year old Polish-German immigrant to France, Herschel Grynszpan. His assassination of a German diplomat, in a desperate reaction to the treatment Jews were receiving in Nazi Germany, served as a catalyst for German propaganda and triggered the catastrophic events of the Kristallnacht—the beginning of a major pogrom to deport Jews to concentration camps. Thompson's broadcast on NBC radio was heard by millions of listeners and led to an outpouring of sympathy for the young assassin. Under the banner of the Journalists' Defense Fund, over $40,000 (U.S.) was collected, enabling famed European lawyer Vincent de Moro-Giafferi to take up Grynszpan's case. The assassination inspired the composer Michael Tippett to write his oratorio, A Child of Our Time, as a plea for peace, and as a protest against the persecution of the Jewish people in Nazi Germany. Who is on trial in this case? I say we are all on trial. I say the men of Munich are on trial, who signed a pact without one word of protection for helpless minorities. Whether Herschel Grynszpan lives or not won't matter much to Herschel. He was prepared to die when he fired those shots. Therefore, we who are not Jews must speak, speak our sorrow and indignation and disgust in so many voices that they will be heard. This boy has become a symbol, and the responsibility for his deed must be shared by those who caused it. "It is not the fact of liberty but the way in which liberty is exercised that ultimately determines whether liberty itself survives." In 2005, The Museum of Television & Radio honored Thompson by including her in their collection, She Made It: Women Creating Television and Radio—a three-year initiative celebrating the achievements of creative and business women in the television and radio industries. They featured her newscasts on FDR’s controversial plans to reorganize the judicial system, and her discussion of the New Deal and other policies. Another featured broadcast was her report on the 1937 Nobel Prize winners and awards ceremonies held in Stockholm, Sweden. (1938) Refugees: Anarchy or Organization? (1944) To Whom Does the Earth Belong? ↑ "Dorothy Thompson," in Dictionary of Literary Biography (Gale, 1984). ↑ "Dorothy Thompson," in Dictionary of American Biography (Farmington Hills, Mich.: Thomson Gale, 2007). ↑ Peter Kurth, Remembering Dorothy Thompson. Retrieved March 24, 2007. ↑ Richard Lingeman, Sinclair Lewis, Rebel From Main Street (New York: Random House, 2002). ↑ "Dorothy Thompson," in Feminist Writers (St. James Press, 1996). ↑ "Dorothy Thompson," Dictionary of American Biography (Farmington Hills, Mich.: Thomson Gale, 2007). "Dorothy Thompson." 1996. In Feminist Writers. St. James Press. "Dorothy Thompson." 2007. In Contemporary Authors Online. Gale. "Dorothy Thompson." 2007. In Dictionary of American Biography. Farmington Hills, Mich.: Thomson Gale. The Eleanor Roosevelt Papers Project, George Washington University. Widner, James F. 2003. Dorothy Thompson - Hitler Invasion of Poland - 9/3/39, Radio News. This page was last modified on 11 October 2017, at 20:00.